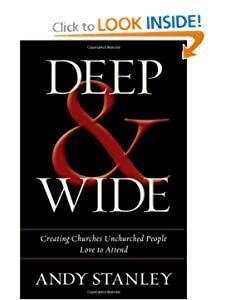 I recently finished Andy Stanley's Deep & Wide: Creating Churches Unchurched People Love to Attend, and I cannot recommend it enough. The goal is to create churches that cast a wide net and attract the unchurched with deep and meaningful life change. The crux of the message rests on Acts 15, or the "first church business meeting". Here we have Paul and Barnabas bringing news of the conversion of Gentiles to the Council at Jersusalem. There was discussion among this Jewish council about what is to be expected of these believers who had never been taught to keep the Law of Moses. Members of the Pharisees, devout followers and upholders of the law, declared triumphantly, "The Gentiles must be circumcised and required to keep the Law of Moses." Essentially, the Jews expected the Gentiles to keep themselves pure sexually and not anger the Jews (by abstaining from polluted food, strangled animals, or blood). That list of commands is a far cry from passage after passage presented in scripture for how to prepare sacrifices for atonement, regulations for "unclean" food and people, and the many, many other laws laid out for Israel. In fact, it looks like the most important thing isn't "what we do", but "who we know" (read: Jesus). I recently had the privilege of attending the Drive Conference hosted by North Point Community Church (where Andy is the senior pastor). It was an incredibly eye-opening experience for me. Every single thing they did was simply the best - the strive for excellence and quality was obvious. The music was loud and riveting. The videos were top-notch and stimulating. The speaking was clear, concise and interesting. This church has their target, "the unchurched", in mind with every program and every part of the experience. Another major takeaway for me related to the teaching and preaching of the church. Here, it is far less about information - the goal must be transformation. The simple example I heard Stanley present was that of David and Goliath. We know the ending to the story and we always know it ends the same way. So how can we go about presenting the material in an engaging manner that makes it lead to life change, rather than just the transfer of information. If you engage a person with something that works and will have a positive effect in their lives, they are more willing to start to believe the underlying biblical truth (and eventually, believe the Bible itself). I cannot recommend this read enough - even if you are not a leader within a church or outreach focused ministry, this book can shape your idea of what it takes to make an organization that routinely focuses on excellence for the glory of God and the good of those who don't yet know Him. "Every Sunday people walk onto your campus and determine whether or not they will return the following week before your preacher opens his mouth. And that’s not fair. But it’s true." "Your environments determine what comes to mind when people think about your church." "The physical environment does more than leave an impression; it sends a message." "Let’s not do what a previous generation did and assume that what’s appealing today will be appealing tomorrow." Josh, thanks for the review! Glad you found the book helpful. I do question the point about getting people to do "what works" so that later they believe the truth that it's based on. I was talking with Andy W yesterday and he mentioned that there is a large movement in secular counseling toward getting people who struggle with dark emotions or depression to basically follow Philippians 4:8... discipline yourself to think positive thoughts. They basically teach people to practice biblical methods without Christ. And it works. People who train themselves to think positively are happier people. They overcome depression. But that seems to me like a scary thing, not a good thing. They're becoming happier, moral people still headed for Hell. Now, I know teaching "what works" from the Bible when we actually point to the Bible and Truth in the person of Christ is different. But it sounds so similar that I thought I should bring it up. Do you have any thoughts on this? My review doesn't do the idea justice. If you listen to Andy Stanley's sermons regulalrly you would likely agree with my assessment that he doesn't "water down" truth, but makes it very accessible. The idea is that we should let the Gospel be the only stumbling block to faith, not our word choice, or environment, or traditions. So it plays out practically like this: If the teaching is on a controversial topic or a challenging concept, you would anticipate concerns early. "You might not agree with this, and that's ok, but hear me out." Or you might give non-believers an out... "If you don't believe in Jesus, then this isn't for you." But you still give them a chance to respond to Jesus. And if your application is a tough one (like choosing to respond in love to every tough interaction you face), you might invite non-believers to "try it out". In my opinion, if a non-believer can articulate the Gospel, but chooses not to embrace it as Truth, then what harm is there in crating environments where they return to "get another dose" of it? I would rather they attend and hear Truth again and again rather than not get that exposure. Does that make sense? So it isn't repackaging truth as useful to believers without Jesus, but making the process of learning about Jesus inviting and even, dare say, fun!